In 1855, St. John Neumann invested three Philadelphia nuns who subsequently started the Order of the Sisters of St. Francis. 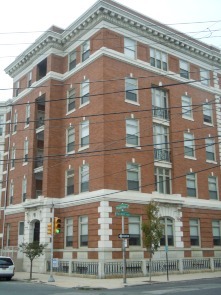 Desiring to help the sick poor of Kensington, the Sisters founded St. Mary’s Hospital in 1860 in a small house at the northeast corner of 4th Street and Girard Avenue. In 1866, they moved to the corner of the Frankfort Road and Palmer Street. The initial four-story building of pressed brick, formerly the site of a hotel on the well-traveled road, had 80 beds and was divided between medical, surgical, and obstetrical wards. 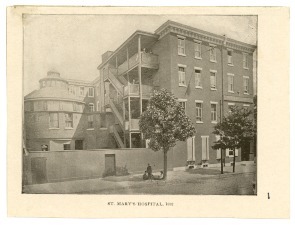 With a small staff that included one chaplain, four physicians, four surgeons, two obstetricians, and a group of nuns who served as nurses, St. Mary’s attempted to treat conditions as far ranging as “Consumption” (tuberculosis) to “Old Age.” Almost immediately it became a much needed fixture of the neighborhood – the nuns had treated almost 16,000 patients by the end of their fifth year. Because the hospital was open to persons of all creeds, their patient-base was reflective of the makeup of the neighborhood at that time, with German and Irish immigrants making up the overwhelming majority. The original constitution of the St. Mary’s Hospital Association was written in German. For generations, the hospital was the place in which residents of Kensington and Fishtown were born and on which they could rely throughout their lives. From the very start, poor patients who could not afford care were treated for free. "Charity patients" made up nearly half of all patients even within the first few years. 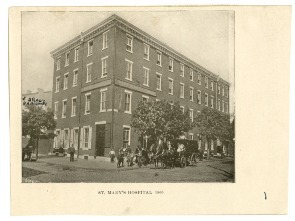 The hospital also became famous for medical innovations: the first brain tumor was removed there by Dr. William Keen in 1887, and he was the “first surgeon in Philadelphia to adopt Lister’s principles of antiseptics.” St. Mary's Hospital continued to grow, and by 1916, had expanded to include nearly the whole block between Palmer and Deal Streets, which had formerly been the Shackamaxon Bank and numerous private residences. In 1915, the original building was knocked down and rebuilt just in time for the celebration of the hospital’s fiftieth anniversary—the new five-story building, which still stands today, included a roof garden and a natural sun parlor. By 1988, with about 700 workers, St. Mary’s was the largest employer in a neighborhood decimated by the loss of most of its industries. Unemployment was 17% in the neighborhood at that time as compared to the city average of 5.8%. By then the hospital employed and served the large Latino population which had settled in the neighborhood starting in the 1950s. Though it had experienced a scare in the 1970s about being phased out to another branch in Langhorne, it was a shock in April of 1988 when the Sisters of St. Francis announced its bankruptcy. They maintained that as population of the neighborhood had shrunk over the years, the hospital in turn had become overextended—its 160-bed capacity had only been half full for years—and could no longer sustain itself. Neighborhood groups held a candlelight vigil at the First Presbyterian Church of Fishtown. According to one resident quoted in the Inquirer, "It's an institution…like the Bulletin. When the Bulletin folded, it broke my heart. Or the Philadelphia A's . . . when they left, it broke my heart." City councilmen supported Fishtown residents in their fight, and a court case kept the hospital open long enough that it could be bought with the help of a much celebrated four million-dollar loan from the city, which recognized the hospital’s importance in the neighborhood. Though it became a for-profit hospital, shut down its maternity ward, and switched mainly to outpatient care, the newly named Neumann Medical Center could not erase its debt. After changes in management which landed it under the administration of Northeastern Hospital in Port Richmond, Temple University bought both hospitals in the mid-1990s and shut them down in 2000 and 2009, respectively. In 2005, Pennsylvania state representative Marie Lederer and a local non-profit helped get the federal department of Housing and Urban Development (HUD) to convert the abandoned Neumann hospital to homes for seniors with incomes less than $18,000 a year. Because it has been designated a historic building and maintains the architecture of the old hospital, Neumann Senior Housing differs largely from the “no frills” senior housing that HUD typically helps develop -- 450-square-foot units and eight-foot ceilings. “One apartment includes the columned porch where recuperating patients sat in rockers to take the air. Another unit inherited a stunning rose window from a former chapel. Many have floor-to-ceiling bay windows or open-air bays. And all have 10-foot ceilings, which give the 585-square-foot units an unusual feeling of spaciousness.” Neumann Senior Center has 69 units, and as of 2010 housed 72 residents, mostly hailing from Fishtown. Despite its new function, the structure at the corner of Frankford Avenue and Palmer Street continues the tradition of community service begun by the Sisters of St. Francis 150 years ago. 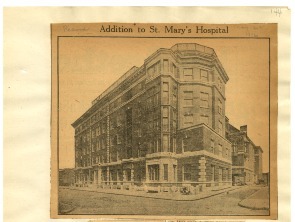 "Addition to St. Mary's Hospital," Philadelphia Record. "Pulling the Plug on St. Mary," The Philadelphia Inquirer, May 12, 1988, Editorial Section. "St. Mary's Golden Jubilee," Philadelphia Record. 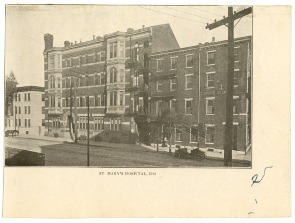 St. Mary's Hospital Verein von Philadelphia. Constitution und Neben-Gesetze, 1866. Fitzgerald, Thomas. "Insider Struggles with Outsider for 175th District House Seat," The Philadelphia Inquirer, April 21, 2004. Gaul, Gilbert M. "What Led to Code Blue for the Hospital in Fishtown," The Philadelphia Inquirer, April 29, 1988. Goldstein, Josh. "Feeling Market's Squeeze, Hospitals Embrace Change," The Philadelphia Inquirer, April 4, 2001. Goldstein, Josh. "Fishtown Medical Center's Fate Raises Community Concerns," The Philadelphia Inquirer, January 6, 1999. Kaufman, Marc. "Landmark is again Threatened with Failure. And City Taxpayers Could be out $4 Million," The Philadelphia Inquirer, March 16, 1993. Maykuth, Andrew. "Troubled Northeastern Hospital is Taken Over by Temple Facility," The Philadelphia Inquirer, February 1, 1995. Milano, Ken W. Remembering Kensington and Fishtown: Philadelphia's Riverward Neighborhoods. Charleston: The History Press, 2008. Nicholas, Rick. "Fishtown Ponders a Future without its St. Elsewhere," The Philadelphia Inquirer, May 12, 1988. 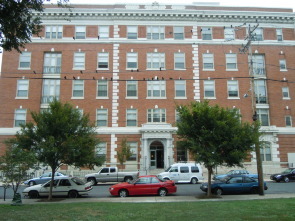 St. Mary's Hospital, of Philadelphia, under the care of the Sisters of St. Francis: 1st, 3rd and 5th annual reports. Warner, Susan, Jim Detjen and Michael B. Coakley. "St. Mary Ordered to Stay Open Emergency Care Must Continue," The Philadelphia Inquirer, May 5, 1988. Wiegand, Ginny. "City Backs Loan to Hospital," The Philadelphia Inquirer, November 24, 1988.